New video is up! 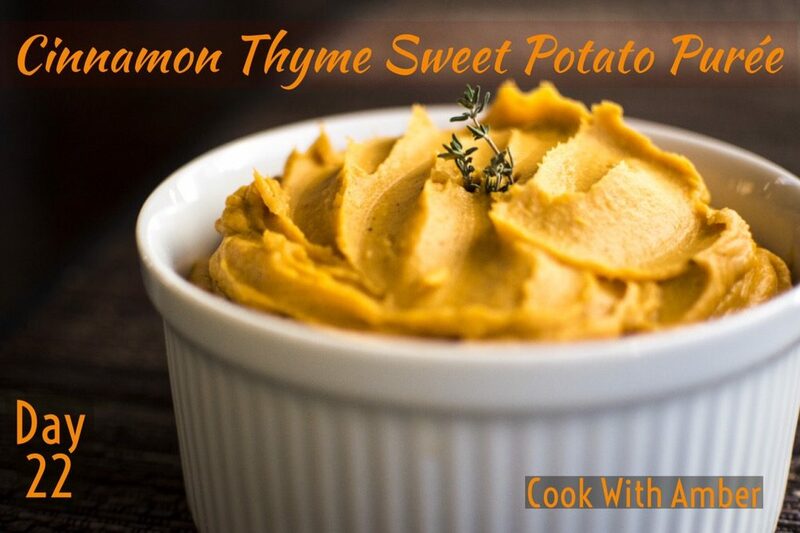 It’s my Cinnamon Thyme Sweet Potato Purée! This is the perfect side dish for a holiday party or dinner. Its creamy, velvety and the cinnamon and thyme really bring out the holiday flavors. You must try this… it is mouthwatering! Oh and did I mention it is super easy? Check out the new video below. Back in 2016, I visited my friend Gibson Borelli (winner of Racheal vs. Guy, season 2) and we cooked dinner together. 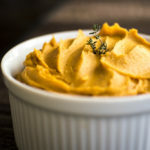 We decided to randomly create our own sweet potato purée going by nothing but our taste buds. Both of us fell in love with our creation and I took the recipe home to Seattle. Since then, I’ve tweaked it a bit, including swapping coconut milk for the heavy cream, and now it’s a total staple on our Thanksgiving/Springsgiving table! It’s creamy, velvety, and the cinnamon and thyme really bring out the holiday flavors. Thank you, Gibson! Over medium heat, melt the butter in a big pot and add the sweet potato, squash, cinnamon, thyme, and stock. Partially cover and let simmer over medium-low heat for about 20 minutes, until the vegetables are completely soft. Stir occasionally, and add more stock if it gets too dry. When the vegetables are soft, transfer into a food processor and pulse a few times to break up the mixture. Then, while the food processor is running, drop in spoonfuls of the coconut cream until the mixture has reached the desired thickness and it is velvety smooth. Taste and season with salt and pepper. Pulse the food processor a few times to make sure the salt and pepper are incorporated, and serve.